I displayed a range of 'Cobalt Vessels', 'Willow Vessels' and 'Cobalt Bottles' as well as brand new 'Cobalt Dishes'. The collection went down a treat resulting in Rebecca Killen Ceramics now being stocked in design boutiques and galleries all over the U.K.
Click here to find your nearest stockist! 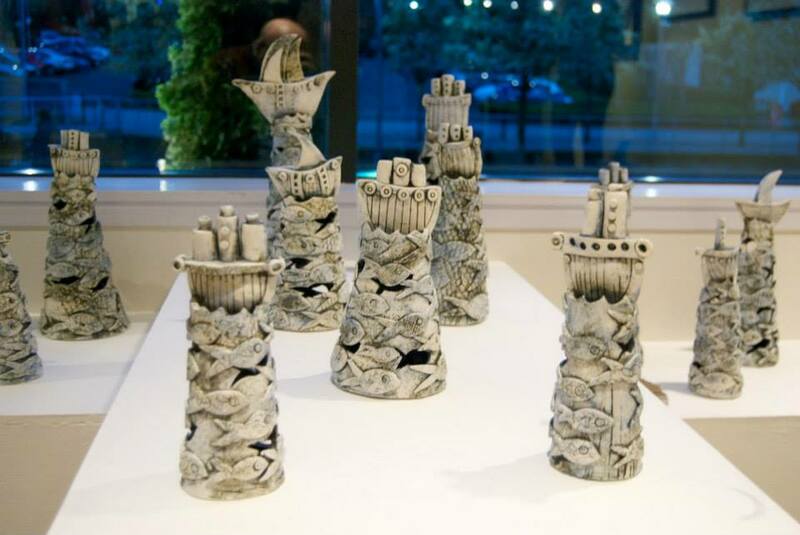 The exhibition Reflections, currently on show in the Island Arts Centre, Lisburn, is an impressive mix of ceramics, painting and textiles from a group of artists who have either worked with, studied with or been taught by ceramicists Trevor Woods and Sinead Young. I first encountered clay when studying at Down High School, with Trevor’s (my art teacher) infectious passion for ceramics it was unavoidable and I was hooked. Trevor has continued to encourage and support me in my career and it is such a pleasure to exhibit my ceramics alongside his beautiful work. An exploration of cobalt on bone china, experimenting with hand painted designs mixed with traditional Chinese tissue prints. Surface pattern is inspired by elements of the iconic Willow Pattern and the combination of stripes and geometric shapes with traditional Chinese patterns. Using the industrial process of slip-casting, I design and create functional and sculptural forms, individually decorated using a variety of printing methods. I tend to work in multiples creating communities of pieces that gather together creating their own unique dialogue. Pieces both functional and decorative, intend to question common values of the function of a form, enabling the viewer to alter their feelings on a particular object. Current work is inspired by my love for blue and white ceramics reflecting on the historical importance and influence of traditional patterns used on pottery. 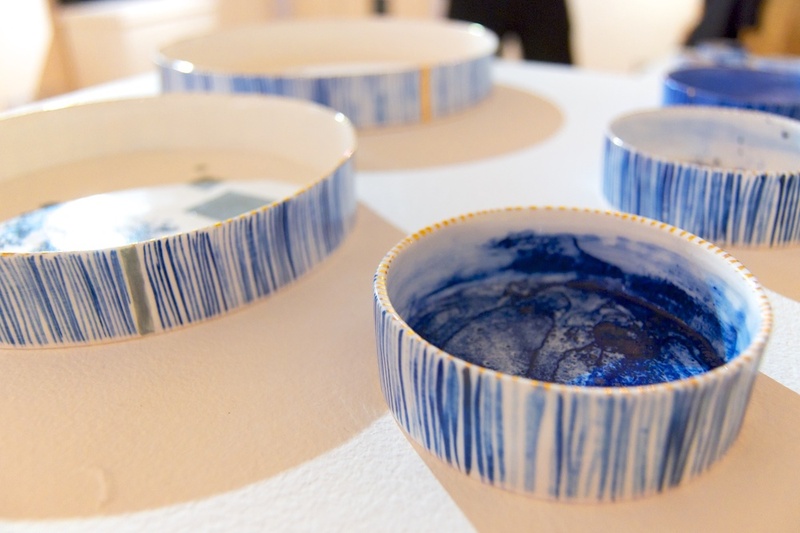 This is an experimental body of work exploring the use of cobalt on multiples of cast bone china vessels. With the growing popularity of the 'Flower Bottles', we are excited to announce that we have expanded the bottle collection. Bottles are now available in Tall, Medium and (super cute) Mini and are decorated with our signature cobalt stripes, dipped glaze or simply plain with a striped rim at the top. As with all our bone china products the bottles are finished with hints of gold (yes, real gold) lustre. We took the 'Mini Bottles' out on an adventure to the beautiful Dunluce Castle which is situated on the North Coast of Ireland and got some great shots, please take a look, pin, share, like and tweet. I was contacted by Ireland's Image Interiors and Living Magazine to take part in their #valuetheprocess campaign, bringing the focus back to skills, materials and time involved in the process of making. Check out their instagram and twitter pages @image_interiors for more inspiring designer/maker/artists, our wee country is full of them! November was super exciting for Rebecca Killen Ceramics as I shipped off an order to the East London Design Store, my first London stockist! I was delighted to have my work stocked in this design led independent boutique in the quirky London Fields and to celebrate the launch of my work they held a special event in the store. Creative couple Della Tinsley and Gideon Cleary invited their loyal customers as well as other local designer/makers to view the new collection and 'meet the maker'. A little insight into the festive period for Rebecca Killen Ceramics. I took part in a number of fairs and exhibitions over Christmas and the new collection proved to be very popular for those buying special gifts for loved ones and luxury blue and white treats for the home. On October 11th-12th I took part in the Improve Your Home Show at the Kings Hall in Belfast. I shared a stand with the very talented Aine McKenna Ceramics, we both were selling our ceramic products and showcasing our large scale ceramic pieces. Here are a couple of images of the event. August 15th-17th was a very busy and exciting weekend for Rebecca Killen Ceramics as I was demonstrating casting and surface pattern techniques, selling bone china decorative and functional products and exhibiting 'Cylindrical Willow Pattern' in the 'In the House Exhibition' all at the Craft and Design Collective's, Craft FEST 2014. The Idyllic venue of Castle Ward was the perfect setting for the annual festival where there were workshops to take part in, demonstrations to see, the best of Northern Irish craft and design to buy and an inspirational exhibition to view in 'The House'. A great video of the opening night of my solo exhibition at Atelier-Design. The video showcases my contemporary blue and white ceramics in the beautiful city centre design studio. The exhibition has been such a success that they have extended it to July 26th. Thanks again Atelier-Design. Ahh where to begin…Finally I am getting around to writing a blog, just a little something to keep you all up to date with what I am getting up to and hopefully an interesting insight into the life of a ceramic designer. June has been a very exciting time for me as on the 5th my first ever solo show opened in the absolutely fabulous Atelier Design (www.atelier-design.co.uk). Atelier-Design is a dynamic and contemporary Design Studio based in the vibrant heart of Belfast City Centre specialising in Interior Design, Architecture and Mid Century Furniture. Atelier-Design is owned by the wonderful Architect and Interior Designer duo James Fairley and Victor Branco, who have recently opened up their beautiful top floor studio on Wellington Place to host monthly art exhibitions. They have had a range of exhibitions (photography, painting, print and my favourite ‘From Process to Pattern’ by Abigail*Ryan Homewares) mostly showcasing local talent. My exhibition, ‘Letters from the East’ presents both new commercial products and exhibition pieces that share common themes of pattern, functionality and process. The pieces sit beautifully amongst the array of stunning mid-century furniture creating their own unique dialogue. The seductive dark walls along with the vibrancy of their carefully selected fabrics and vintage ornaments was the perfect backdrop for my signature blue and white, Bone-China vessels and wall mounted pieces. "Letters from the East" explores the methods of combining traditional making and decorating processes with digital ceramic transfers on fine bone china while creating contemporary ceramics that are enriched with social and historical references. The vessels both functional and dysfunctional, intend to question common values of the function of a form, enabling the viewer to alter their feelings on a particular object. The objects seek to narrate certain historical and social contexts through the use of imagery and text. The opening night was a great success, thank you to all who came along, it was so nice to get chatting with some interesting characters and receiving feedback on pieces that had never been shown before. Exhibiting at Atelier-Design has been such an amazing opportunity for me and a real highlight in my career, I am so thankful to James and Victor, who worked so hard to put the show together and promote my work throughout the month. Thank you guys, you are AMAZING!! !